Angelo and Lou traversed across Timor Leste with their blow up screen and portable equipment in their Rentlo Troopy over a 17 week period. 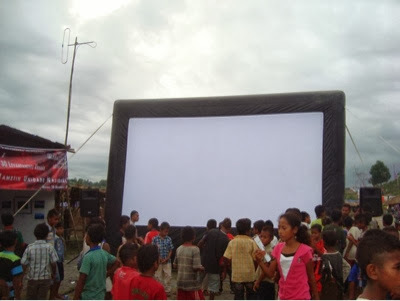 They screened to 49,000 people, on 61 nights in 55 villages. Crowds ranged from a few hundred to a few thousand each night. The main film shown for the year was A Guerra da Beatriz, thanks to Dili Film Works, with some screenings of Bloodshot and Balibo throughout. At the end of its third successful year, the team is now well ingratiated with the regions and screening visits are highly anticipated. - Rentlo Car Hire in Dili, and especially to Kieren for his support. - Timor Telecom for communication sponsorship, and always having something to give away to the kids. - Schweppes is a new sponsor, supported from their Melbourne office. - the State Cinema in Hobart, owned by John Kelly and kindred cinema to the Sun! - the Sun Theatre in Yarraville, Melbourne and the public of most glorious Yarraville and the Inner West.